Container gardening can be a joyful experience for city dwellers or people living in flats, apartments or renting a space in which they do not wish to invest loads of money on the garden. When selecting the type of plants you want to grow, you need to consider the space which is going to be utilized for this purpose, what size containers will be needed, and whether the space is sunny and bright or cool and shady. All these things play a huge part in determining what type of container garden you are going to create. Pros: They are very traditional and come in loads of standard sizes. The root zone can breathe and they are readily available at most stores. Cons: The cheaper pots can be very brittle. They also stain quite easily on the outside. Pros: These containers are light in weight. They can be made to your specifications and painted. Cons: Wood rots so these containers in general only really last for about two years before needing replacement. The ones that have been lined are normally quite expensive. Pros: These containers come in standard shapes and sizes. They are quite light in weight and therefore easy to move around. You can become quite innovative in your choice of container. 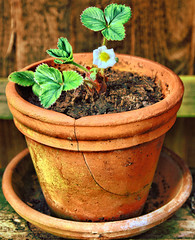 Empty metal garbage cans have been used for container gardening. Cons: Unfortunately metal can rust, especially the cheaper metals. They can also become extremely hot in sunny spaces. Pros: There is such a large variety of these available and they come in just about any shape, size or color you are looking for and are affordable to most people. Cons: Should you not purchase all your pots at the same time you may find difficulty in matching the color at a later stage. These containers can also be very heavy. Very cold weather can cause the glazing to crack. They also tend to be an easy target for thieves. Pros: These containers come in various shapes and colors. The material is very durable and the color is stay-fast. They can also be made to look like other materials. i.e. wood, clay. Cons: They scratch easily (cats and dogs) and can be quite expensive. Pros: They are cheap, last forever, and you can get them anywhere. Cons: There is not much you can do to disguise the fact that they are plastic and look like plastic. The pros of container gardening are that space is simply not an issue. There is a plant for every occasion and a container to match. Another pro to container gardening is that you can move your containers around and you can have a new look without it costing you a fortune. The cons are that, depending on where your space is, it could place a limitation on your gardening ideas. Let your imagination run free. Container gardening is fun and low maintenance. Many countries have developed their distinctive garden styles. Wondering which possibility to choose? There are 11 types of gardens. Here is everything about their characteristics and origin. 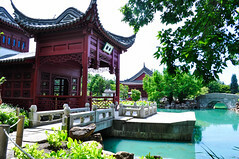 The Chinese garden style has been evolving for more than 3000 years. Poets, scholars and members of the royal family enjoyed landscaping and used it as an opportunity to impress. The Chinese landscape is inspired by the harmony between man and nature. 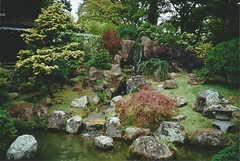 The garden can have a pond, rock decorations, assorted flower beds, trees and pavilions that are connected to each other via alleys. The Chinese garden is enclosed within high walls. The Dutch garden features some of the most practical space utilization. Geometrical patterns and symmetry are very common for Dutch gardens. The flower beds and alleys are usually enclosed with walls or hedges. Dutch gardens were very popular in England in the past. They were the opposite of the cottage garden that has asymmetrical arrangements. French style that was used throughout Europe in the 17th century. The English park features a lake and lawns that are set against a forest. The English garden can also include temples, statues and classic ruin decorations. There are several French garden styles. Jardin a la francaise is probably the most popular variety. This garden style was prominent in 17th century Europe. 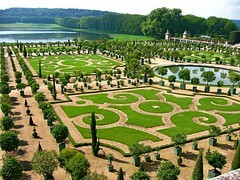 It was characterized by order and the Versailles garden are the perfect example of this landscaping style. The style was heavily influences by the Italian Renaissance. The French landscape garden is another style that is much more romantic and less orderly. Greek gardens were popular in Ancient Greece but little is known about their characteristics today. 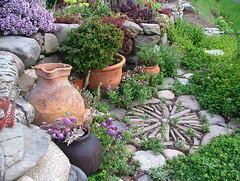 During the Classic Greek period, gardens were minimalist and mainly characterized by the use of pots to hold plants. In the fourth century, private gardens became popular in Athens. This garden style emerged in the 15th century. 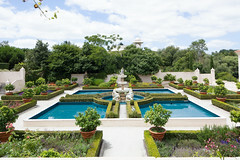 The classical ideas of symmetry, order and beauty inspired landscaping efforts. Fountains, statues, symmetrical flower beds and grottoes were all typical for Italian Renaissance gardens. Their purpose was to impress the viewer and to allow for full exploration of nature’s harmony. Two styles originated in Japan – the rock and the tea garden. Japanese rock gardens are also called “landscape”. In the 11th century, Japanese zen gardens were copied in China. These are characterized by rock arrangements, moss and the use of racked gravel or sand. Roji or tea garden is the second variety. Roji gardens are characterized by simplicity and humbleness. There are inner and outer gardens that have a pond, stepping stones, wicket gates and lanterns. Korean gardens appeared 2000 years ago and they are characterized by simplicity. These gardens are very informal and they have no aim of introducing human order to the natural world. Asymmetry is common for Korean gardens. 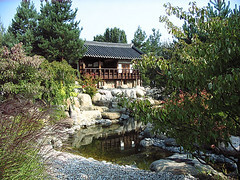 Korean gardens usually have shaped trees, ponds, streams, rock arrangements, waterfalls and fruit trees. 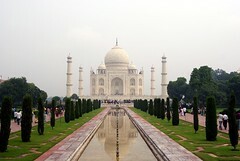 The Persian garden is called charbagh and the Taj Mahal landscaping is probably the most popular example. Persian gardens are quadrilateral. Water is used to divide the garden space into walkways. 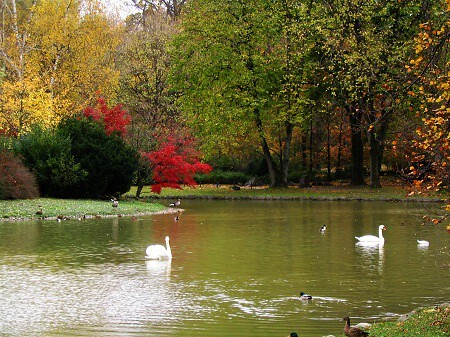 There are trees planted to attract birds, which is one of the most prominent characteristics of charbagh gardens. The Spanish Andalusian patio is actually influenced by Arabic and Persian landscaping. 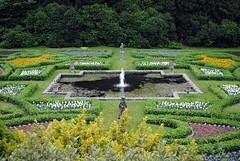 Gardens are rich and full of aromatic flowers, ponds, fountains and decorative figures. 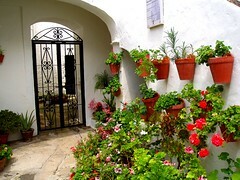 The Andalusian patio has been around for centuries but the style became prominent in the 15th century. Frescoes and marble walls that are used for the creation of decorative shapes are very popular in this type of landscape. The American colonial revival gardens date back to the Colonial period and they are characterized by order and simplicity. Alleys are straight and the same applies to the flower beds. Low walls or hedges enclose the garden space. The purpose of the garden and its location was determining for its appearance during the Colonial period. Often, such gardens were used for the planting of fruits and vegetables. Gardens differ on the basis of decorative elements and purpose. There are many possibilities to choose among and today, the 11 garden styles are still popular and widely used. 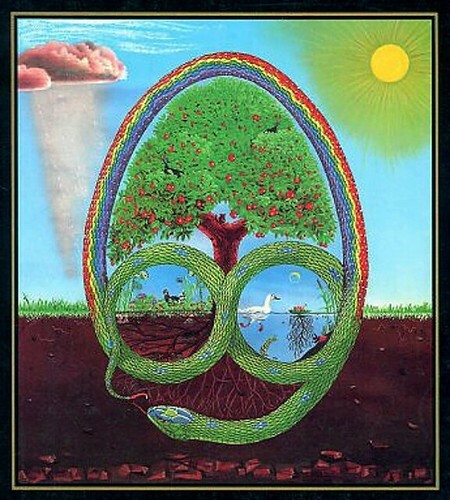 Permaculture is a coined term from the 1970’s from Australians David Holmgren and Bill Mollison. Permaculture incorporates design principles that bring about a change for the better in social, political, economic, and personal approaches to living beyond existing. There are twelve design principles that are centered on three core ethics concepts: care for the Earth, care for the people, and a fair distribution of goods. The first core idea of permaculture is care for the earth. In essence, this core value means that we have to take the time to keep the earth healthy. This is done by keeping soil health so that other living creatures can stay healthy. All living things rely on the same soil, the same water and the same food. It is essential that all things be respected regardless of how insignificant they may seem to us. Each living entity has its place in the circle of life. The second core idea is that of care for the people. Simply put, it comes down to focusing on opportunity rather than obstacle. No one, no matter how talented and resourceful, can make it through the world on their own. It takes a cooperative effort from as many possible people to get things moving in a positive direction. Rounding out the core values of permaculture is sharing and equal distribution. This is about knowing when and how much you need and how much you need to leave to others. The mentality of hoarding or retaining more goods than what is needed promotes negative waves on society as a whole. By learning to balance what is needed to what is available others will learn to follow suit to bring about positive change to the masses. The combination of these three core values is set into motion and sustained by twelve guiding principles. The first of these design principles is to observe and interact. This means that you take time to see what is going on around you and become involved. It may be something such as a community garden, or understanding the interrelations between all living things and understanding their value. For example, the bee is considered by many to be a pest, but in reality the bee is our top pollinator. Without the services provided by this species, we would not have food to survive. The second designing principle is all about renewable resources. Solar energy, heat energy from the earth, wind energy, and hydro energy are all methods that can be used to capture and store energy for later use with little to no use of non-renewable sources. Rain water can be collected and used to irrigate crops. Trees and other plants produce material to use for shelter, heat, clothing, and nourishment. Permaculture relies heavily on a significant reduction of the carbon footprint. The next principle in our design schematic is obtaining a yield. This means that something will come from the activity we are taking. It may be an immediate use such as grapes or other fruits that we can eat, or it might be something gained over time like a jar of honey. Following the yield is the principle of self regulation and feedback. This comes down to understanding what your role is on the grand scheme of things. For instance do you really need three lights on in a room when one would work just as well? Design principle five involves knowing the use and value of renewable resources and services. An example of this is the goat. Goats are great eaters of grasses and plants that may not be appealing to cattle or other grazers. Their consumption of these less desirable products allows other animals to graze on better goods. The goat can also then be used for a source of milk, and even a source of meat. This fits in nicely with design principle six which states that we should not be wasteful even in times of abundance. It is all too easy to discard things because we feel there is too much, but in thin times what we have wasted would be much desired. Imagine yourself looking out your back door. Do you see all the things that are around you, or are you fixed on a specific zone? Principle seven is about being able to distinguish the forest and the trees. Often times we get so hung up on the details that we forget to look at the big picture. This is a permaculture nightmare. Every detail is important to the overall outcome. Working together as a team rather than segregating differences is the backbone of design principle eight. The idea here is that by working in a cooperative spirit rather than trying to split away more can be accomplished for the greater good. We are all people with the same goal, to live a peaceful life amongst each other. There is no place in permaculture for separation to succeed. Design principle nine exemplifies the resilience of utilizing local resources in small amounts. Just because something is bigger does not mean that it is better. Sometimes having something to big can be more of a detriment than an advantage. A permablitz is a community scale garden that is designed specifically around the area it inhabits. Local residents can then receive items specially grown in their immediate area. We have seen diversity incorporated into the workplace, and it is the mantra of many a corporation. This train of thought also lattices its way through permaculture principles. Understanding the use and value of diversification is a cornerstone to the whole element. Just as it is important to recognize we all strive for the same goal, so is it important to understand that our differences combine to make us stronger as a whole. The final two design principles are about knowing what path to choose when and finally knowing when to make a needed change. The most followed path is not necessarily going to be the best path to achieve the goals you have set. There are specific elements that apply to your area that will need to be incorporated. Listen, watch, and observe the surroundings, and you will know what needs to be done. Permaculture is a growing and needed plan of action for sustaining nature and life on earth by making use of natural resources and reducing the carbon footprint. It is a series of principles to be employed by all inhabitants of our planet to ensure the continued success of a lasting relationship between man and nature. Water marbles and beads are a wonderful way to stop worrying about watering your indoor plants as often. They are made out of a special polymer gel powder that will eventually break down into water, carbon dioxide and nitrogen. Not only do they provide water for plants, but water beads also look beautiful as well. Here is a closer look at some of the benefits to using these beads and marbles, as well as a look at some of the top indoor plants to use with them. Using these beads and marbles provide many excellent benefits. The following are some of the important benefits these water beads and marbles have to offer. – Benefit #1 – Steady, Slow Moisture – One of the benefits these beads have to offer is steady, slow moisture for your plants. This is particularly handy for individuals that do not have time to water plants on a regular basis. – Benefit #2 – Replaces Dirt or Potting Soil – For some plants, these water marbles can actually replace the dirt or soil, which means you don’t have to worry about the mess that dirt and soil can create. 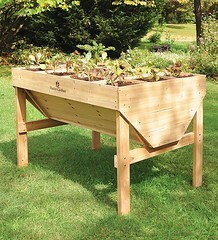 Of course, they can also be used along with soil to ensure the soil has constant watering. – Benefit #3 – Decorative Appeal – Last, these marbles also provide decorative appeal to your plants. They can stabilize plants while adding something special to your home décor. Just a few of the lovely colors available include purple, orange, black, clear, aqua, yellow, pink, coral and green. Many different indoor plants will do well when you add these beads to them. Some plants will do well with just the beads. However, some plants are better with soil and beads. Other plants may not do well with the beads, since certain plants don’t need as much water as other. Some plants could even rot and die if you use the marbles with them. This is why it’s important to know which plants will grow well with the marbles. – Indoor Plants That Work Well with JUST Beads – One of the plants individuals commonly use these beads with is bamboo. It does very well with the beads. Other plants that will work well with JUST the beads and no soil include dragon plant, spider plants, arrowroot, heart leaf philodendron plants, dieffenbachia, dracaena and palms. – Other Plants That May Work Well with Marbles and Beads – Some other plants that work well with marbles and beads, often with soil and marbles combined, include schefflera, aloe, inpatients, paper whites, begonias, elephant ear and cypress. – DON’T Use Beads with These Plants – Certain indoor plants will not do well with these beads. Plants to avoid using with them include orchids, cacti and succulents. As you can see, many plants will do well with water beads. Keep these guidelines in mind as you choose plants that you want to supplement with water marbles. You’ll make it easy to keep plants watered while adding something beautiful that complements yours plants’ natural beauty. If you have any questions on what water beads are and how they work, contact us and maybe get on over to our site and get in on some of those great specials! Have you ever gotten back from a short vacation only to come home to your plants drooping, aching, brown leafed and sad? You can almost hear their tiny plant voices crying out, “You left us! You forgot all about us!” It brings a tear to my eye. 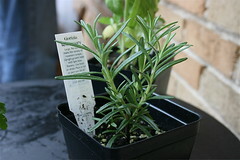 Then gain, not all of us have, “Don’t forget to water the plants,” at the top of our priority lists. Life can get busy, and fast! Work, school, play, dinner and whatever else the universe can cook up for you, they’re all tugging at your limited attention and your poor plants just aren’t that loud when they ask for your help. Well, thankfully you can get some water beads to help you along. Your plants will thank you! 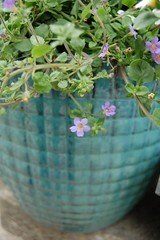 Bamboo pots, flows or even fresh-cut roses can all benefit from the use of water beads. Water beads can act as a great, colorful addition to any plant you want to preserve. They’re colorful and fun on their own, but paired with your plant you can accent your room with some great colors and bring a little life into your home. But, like I said, the best thing about the water beads for some people is the fact that you don’t have to remember anymore. You just let these little super absorbant polymer beads soak up some water, use them with your plants and forget about it for a while! You’ll cut down a ton on the amount of time you spend watering your plants. Please contact us if you have questions about how our water beads work or how you can use them with your plants at home.